Our day one in Paris continues..
After a quick stop for coffee and juice to keep hydrated, we headed for the ferries, purchased our tickets for about 18 Euros (for both days) or 16 Euros (for one day), on the Batobus (the name for the hop on hop off ferry). 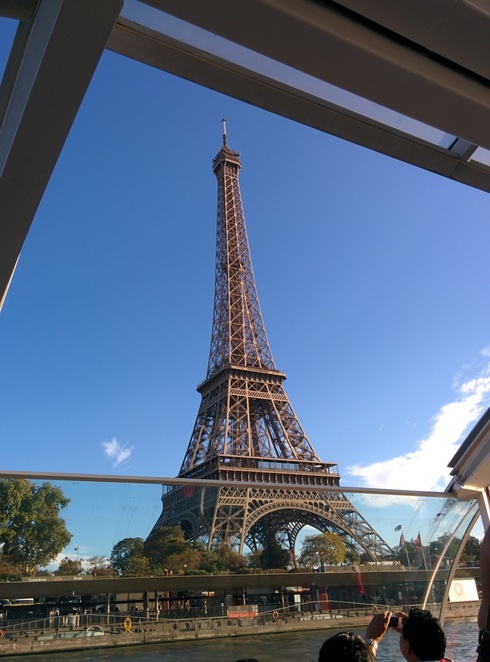 We cruised our way to our next destination, the Eiffel Tower along the Seine, which also stopped over at various other tourist destinations including the Royal Palais, Notre Dame of course, and Champs-Élysées, however I believe it would be a fair walk from the ferry stop so I'd probably catch a Metro instead. 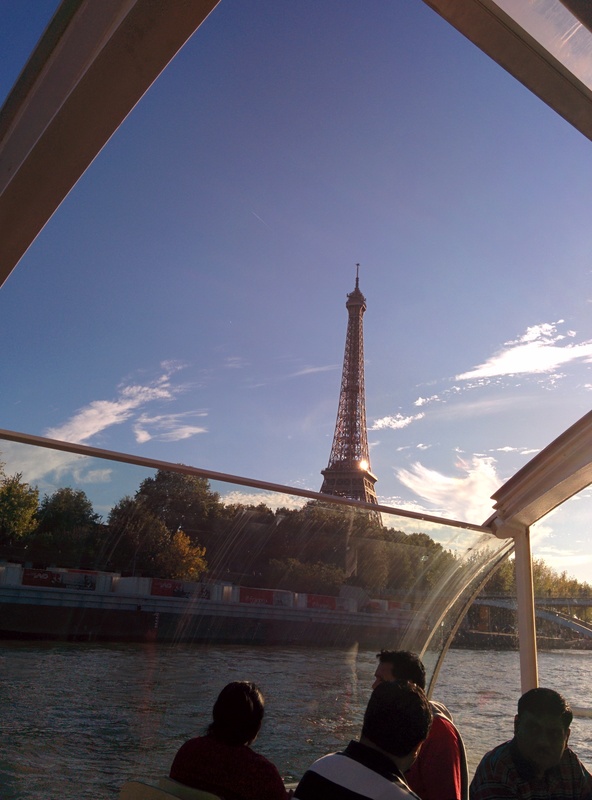 You can't miss the Eiffel Tower and photo opportunities will arise even before the ferry stops. The elegant structure stands proudly overlooking the water on one side and a garden on the other. 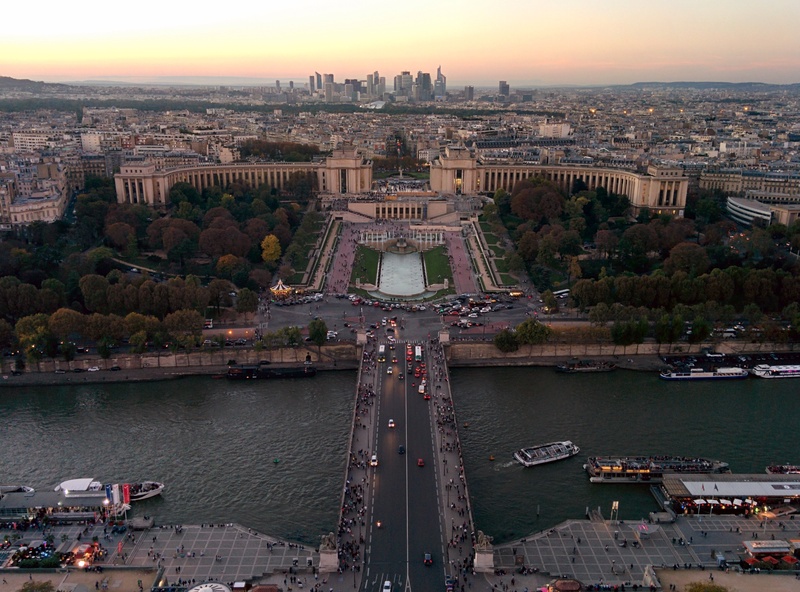 We were lucky to get there later afternoon before sunset, and because we waited almost an hour and a half in line to purchase a ticket to the second viewing floor of the tower, by the time our lift took us up, snapped a few pictures, and came back down, it was dark and the Eiffel tower was magnificently lit. Its golden hue glimmering against the night sky like a jewel. 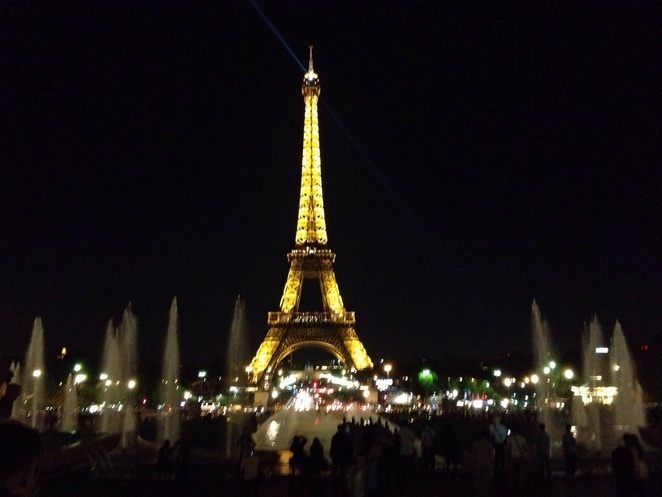 It is definitely the jewel of Paris in my eye, even more beautiful at night. When it was built, it was the world tallest tower and all were in awe of the advanced architectural design of the entirely steel structure; now it is no longer the tallest by any means, but it is glorious nevertheless. Definitely my favourite Parisian attraction so far. You can also view the entire city from the second floor but also all the way from the top of the tower which is an additional fee. 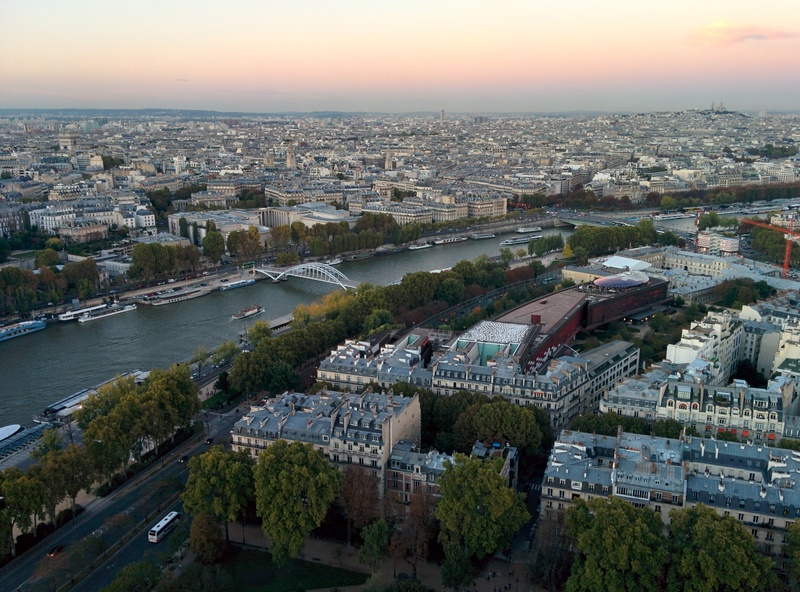 I was struck by how the old French buildings all looked so similar, a creamy, pink hue with grey- blue roofs, juxtaposed with the modern constructions which lacked the same lustre. The uniformity of most of the city was remarkable, in contract with a handful of tall skyscrapers that formed the official city skyline. There is also a restaurant on the first floor of the Eiffel Tower, probably best reserved for a milestone occasion- I did not enquire as to how much it costs to dine here. That evening we have a sumptuous authentic Indian dinner (yes Indian in Paris) at Saravana Bhavan near Gare Nord station, where we queued outside for about 15 minutes as it was a Saturday night and the restaurant was jam packed. Probably the fastest turnover I've ever seen at any restaurant, the service was super efficient, and our meals were delivered almost immediately. Not just that, they were true to the honesty and deliciousness that Saravana Bhavan restaurant chain is famous for and having walked so much that day, we were famished and I would say I could've eaten a horse, but we are vegetarian and so was the restaurant. 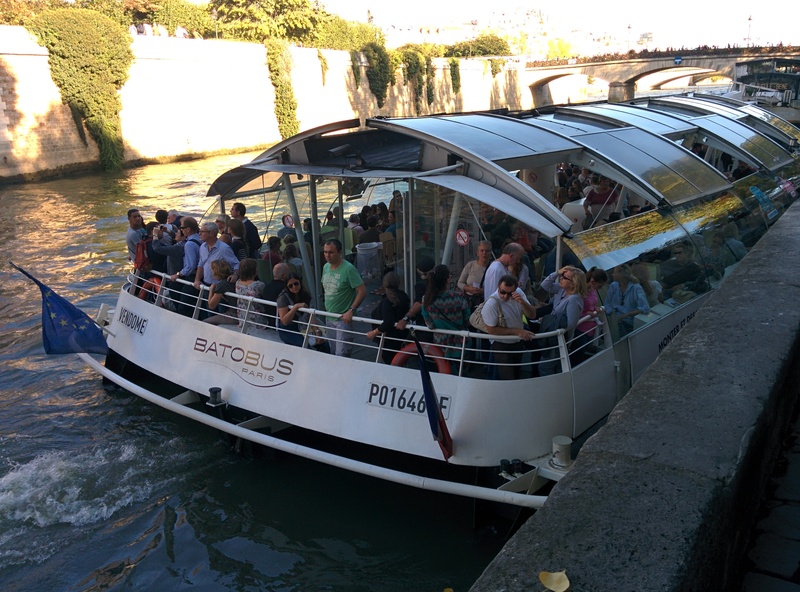 Overall, a fabulous day with fabulous weather and we had successfully managed to check off our list of top attractions- the Louvre, Notre Dame, the Eiffel tower and managed a Seine cruise within that too. Why? A modern experience of Old Europe..